The 'Spider Diagram' is a type of hierarchical organizational chart used in Innoslate as a means of visualizing traceability. This diagram is capable of displaying up to nine levels of decomposition of entities arranged in concentric circles radiating outwards from the center, and conforms to the LML Specification 1.1 definition of a 'Spider Diagram,' which requires a visualization for traceability beyond what a typical hierarchy type diagram can offer. The 'Spider Diagram' is not composed of special diagram constructs. In fact, a 'Spider Diagram' can be generated by Innoslate on the fly based on the current contents of your project’s database. 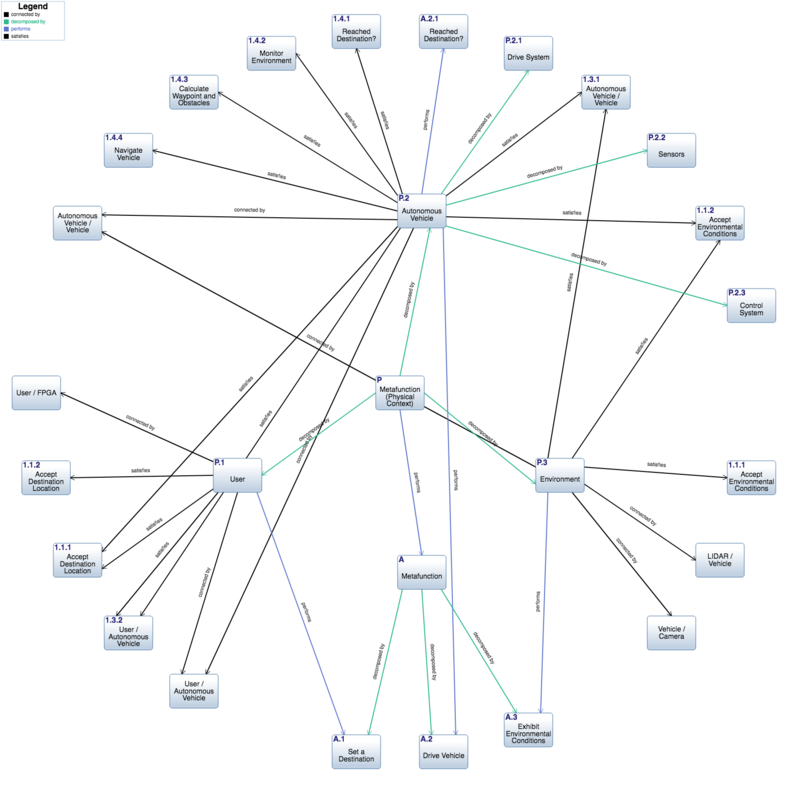 The 'Spider Diagram' is built using entities in the database of any class and any of their relationships. The entities display as rounded blocks containing the number and name of the entity, and their relationships create the structure displayed as arrow lines. Viewing Spider Diagrams You can 'View a Spider Diagram’ of any new or existing entity of any class via the 'Open' drop-down menu, where available. Adding an Entity An entity can be added to a ‘Spider Diagram’ via drag-and-drop. The ‘Spider Diagram’ is a type of hierarchical organizational chart used in Innoslate as a means of visualizing traceability. This diagram is capable of displaying up to nine levels of decomposition of entities arranged in concentric circles radiating outwards from the center, and conforms to the LML Specification 1.1 definition of a ‘Spider Diagram,’ which requires a visualization for traceability beyond what a typical hierarchy type diagram can offer. The ‘Spider Diagram’ is not composed of special diagram constructs. In fact, a ‘Spider Diagram’ can be generated by Innoslate on the fly based on the current contents of your project’s database. The ‘Spider Diagram’ is built using entities in the database of any class and any of their relationships. The entities display as rounded blocks containing the number and name of the entity, and their relationships create the structure displayed as arrow lines. Viewing Spider Diagrams You can ‘View a Spider Diagram’ of any new or existing entity of any class via the ‘Open’ drop-down menu, where available.